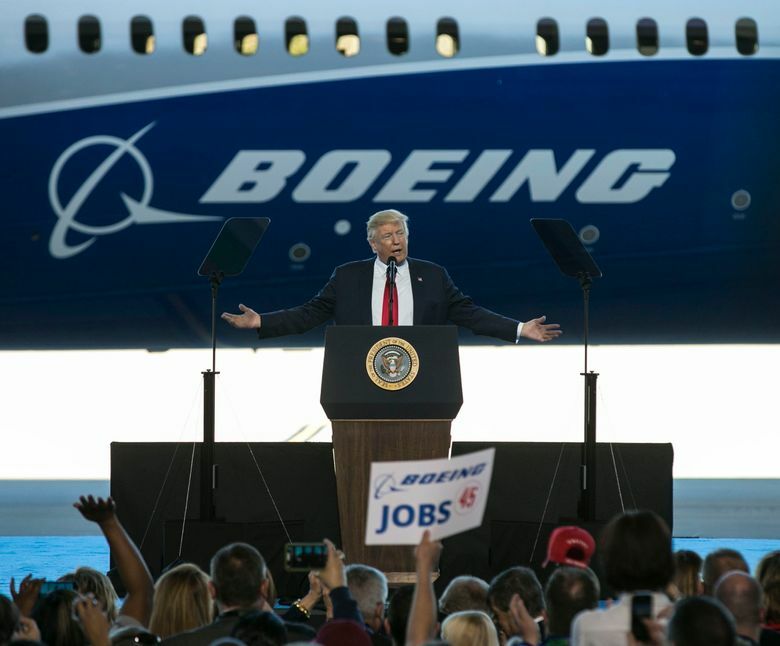 Trump’s message of “Buy American and hire American” was delivered in front of the latest version of Boeing’s Dreamliner, acknowledged by the company as the most outsourced airplane it has ever designed. 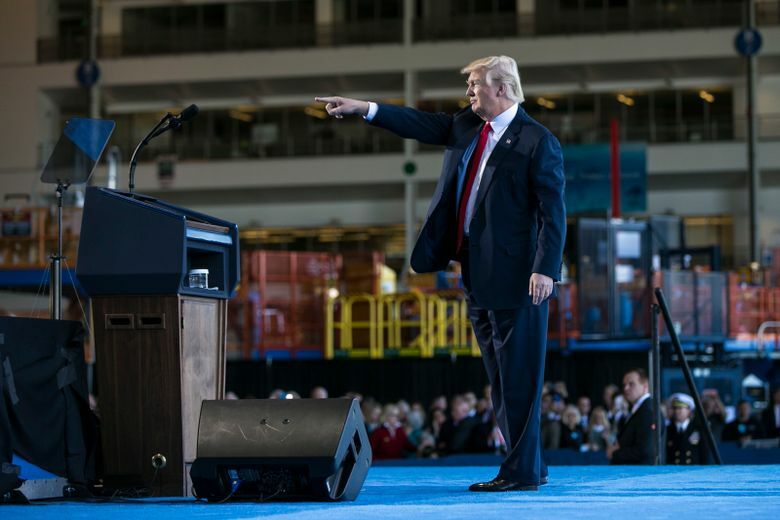 NORTH CHARLESTON, S.C. — Hoping to shift attention from his troubled White House, President Donald Trump hit the road Friday to deliver a pep talk to American workers and the rest of the nation, resurrecting the jobs promises that powered his election victory. 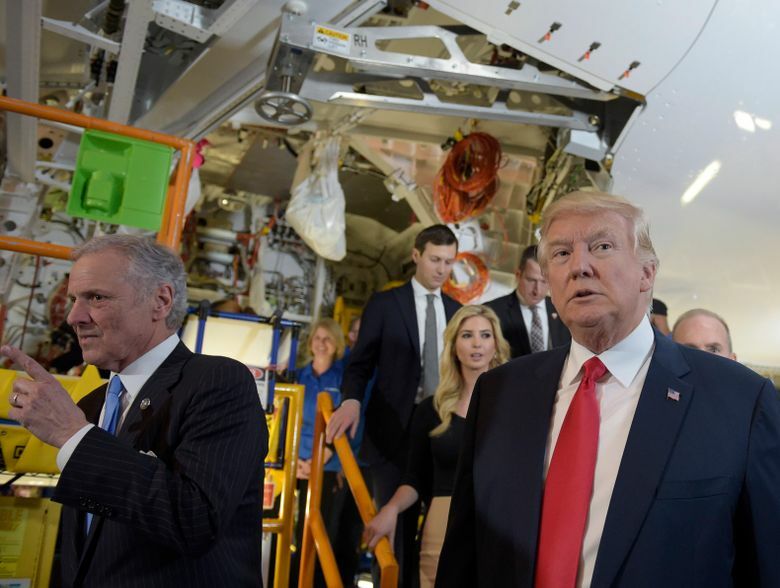 “We love our workers and we are going to protect our workers,” Trump declared at Boeing’s North Charleston, South Carolina, plant where the company showed off its new 787-10 Dreamliner aircraft, the longest version of the twin-aisle jet. “We are going to fight for jobs. We are going to fight for our families,” he said in a reprise of the “America First” message from his campaign. Trump is expected to stick to the theme Saturday when he holds a big rally in Central Florida, a change of scenery that marks an effort to galvanize a month-old White House that has been buffeted by crisis and paralyzed by dysfunction. 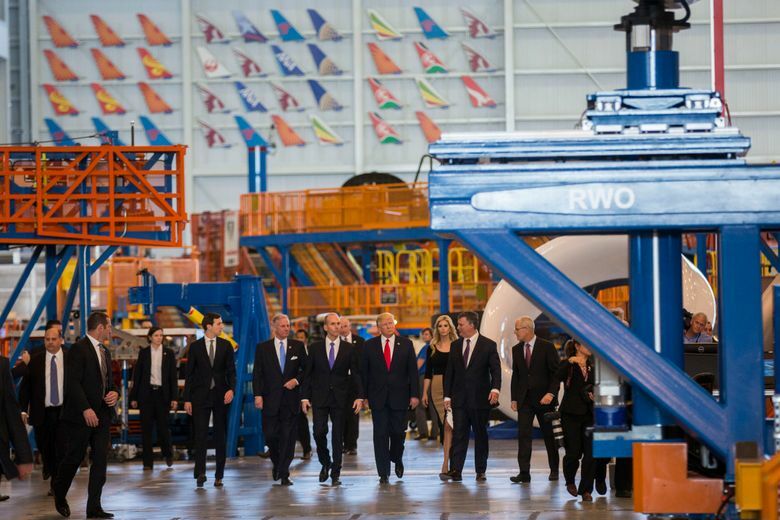 An unprecedented worldwide network of strategic partners makes key sections of Boeing's 787. 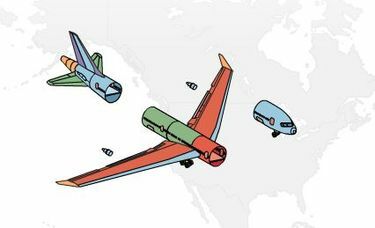 See animation of the 787's global supply chain. Ironically, the 787 Dreamliner is famously the most outsourced airplane Boeing has ever designed. The jet is assembled in Everett and North Charleston from large subassemblies built around the world. Of the composite plastic airframe, only the forward fuselage, the vertical tail and the rear fuselage are built in the U.S. The wings come from Japan. The long center fuselage pieces come from Italy and Japan. The horizontal tail comes from Italy. 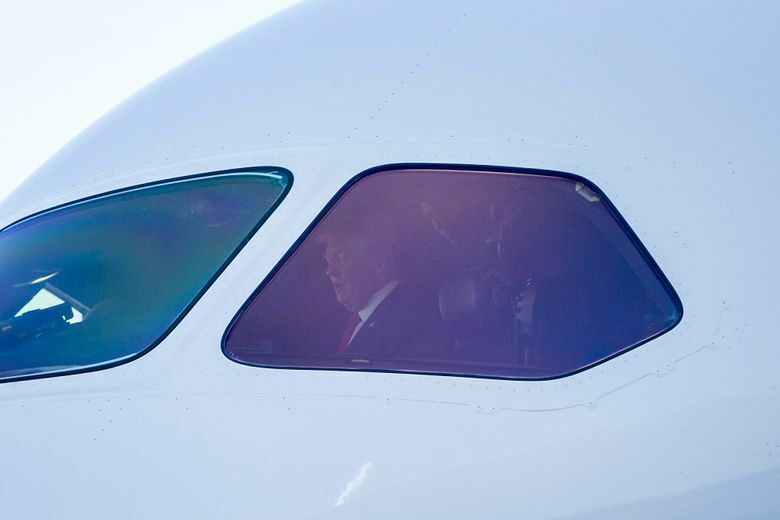 The president, who owns an airplane but now travels exclusively on government aircraft, praised the Boeing jetliner as “an amazing piece of art.” He noted that it’s made of carbon fiber, seats 330 passengers, is 18 feet longer than the previous model and can fly for half a day before landing. Trump also suggested that a larger purchase of Boeing’s F/A-18 Super Hornet may be in the offing. “We are looking seriously at a big order” Trump said of the jet fighter. 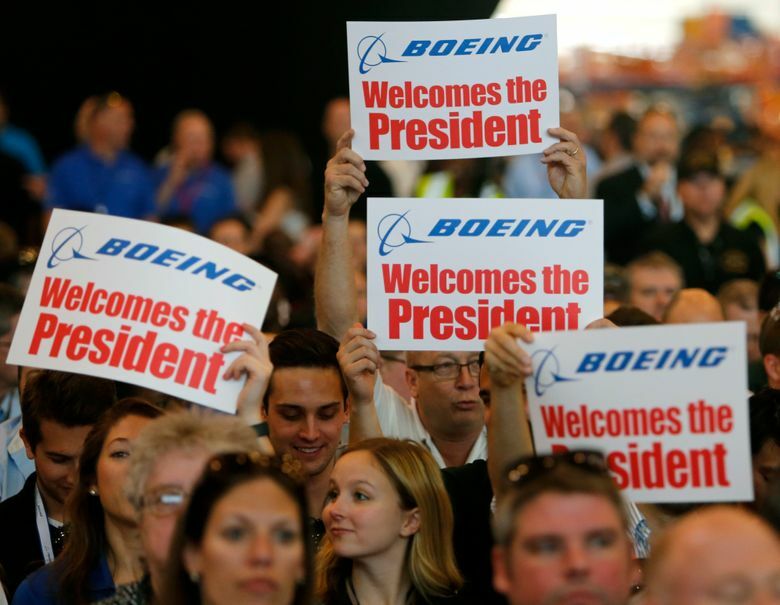 “The problem is Dennis is a tough negotiator,” referring to the Boeing CEO. Earlier, reporters spotted Chief of Staff Reince Priebus holding a brochure for the F/A-18 XT, a proposed Super Hornet upgrade that could serve as a stand-in as Lockheed Martin ramps up production of its delayed F-35 fighter, which Trump has also denounced as too expensive. During the day Trump also swerved from his jobs message to escalate his complaints about news coverage of his young administration. “The FAKENEWS media … is not my enemy, it is the enemy of the American People!” he exclaimed on Twitter, singling out The New York Times and TV networks. Trump arrived late Friday afternoon at his estate in Palm Beach, Florida, where he plans to spend the holiday weekend. Trump has scheduled a campaign-style rally Saturday in Florida during his third weekend trip this month to what he calls his “Winter White House,” his Mar-a-Lago resort. Seattle Times staff and Bloomberg News contributed to this report.